So what did we learn by holding a film festival in Second Life? We got the answers to several questions we had. We even got the answer to a question we hadn’t asked ourselves. 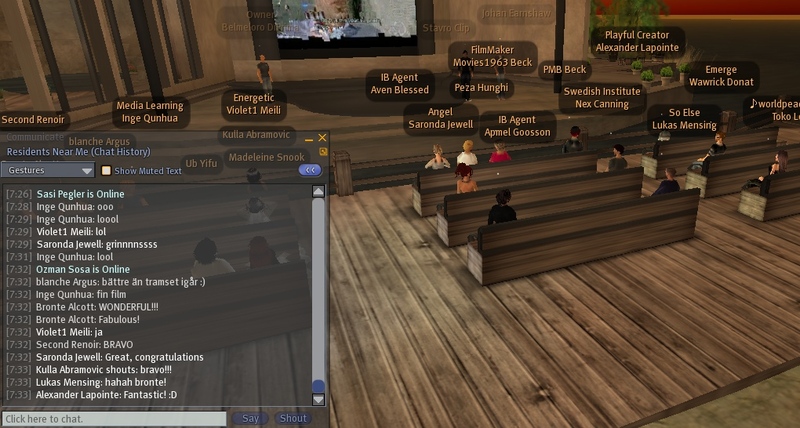 Here’s what we wanted to learn by holding a two-day festival of Swedish short films: Can you sustain a multi-day event in Second Life? (Will people show up to the second day?) Can you show a half-hour long film in Second Life? (Is the technology mature enough for half-hour films, and is Second Life conducive to this kind of sustained attention on the part of avatars?) Can you generate a meaningful debate on film in this context? And the question we hadn’t asked — What happens when a griefer shows up, intent on disrupting the events? I’m glad to say that yes, multi-day events are sustainable. The festival was attended on both days, but there was an even bigger audience on the second day, likely due to word of mouth. Technically, too, a half-hour film is sustainable. Everything held up, and we received no complaints about the quality of the video image. Subtitles were legible (though we wrote a memo to self that they could be a bit larger in the future). As for film debate — here the audience proved a bit shy:-) But this may be because Second Life residents are not necessarily film buffs, and were instead just there for a good time watching an interesting movie. In any case, as the commentary in the screenshot below shows, members of he audience had no qualms in making their approval known, even if they didn’t have so many questions for the directors and producers. On the first day, just as the film got going, a griefer interrupted the proceedings by having his avatar wear a processor-sapping item of clothing and later by having photos flying around. This is the first time since the opening of Second House of Sweden that we’ve had to deal with a griefer, and it was a good reminder that we need to be vigilant. It took us a while to pin him down and ban him, in part because he managed crash our Second Life clients before we knew what was going on. Before the next day’s events, it was time to beef up security measures — we simplified the banning process for the entire region, and also learned som tricks for quickly identifying a griefer and ejecting him before his antics become a nuisance. We had no further trouble, while the griefer did us a favour by reminding us to stay on our toes.